Need to convert, add, subtract, multiply and divide feet and inches? Don't waste time with manual calculations and looking up conversion tables! 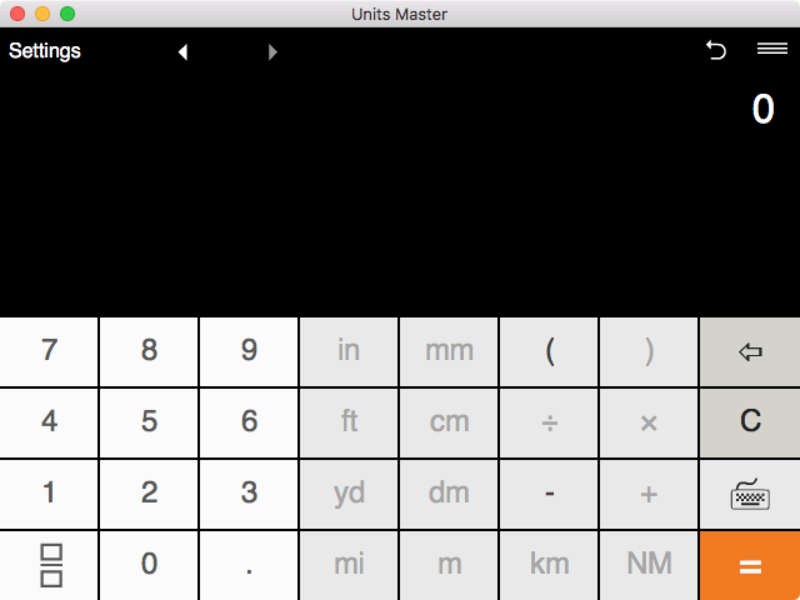 Units Master provides all the capabilities you need for decimal and fractional feet and inches calculations and conversion. - Feet and inches addition, subtraction, multiplication, and division. - Fast conversion between feet/inch measurements. - Convert fractional values to decimals and vice versa. - Supports standard and metric units and allows you to mix them in your calculations. - If you multiply length units, the app shows results in square inches, feet, yards, etc. - Advanced history option to easily go back and forth and verify that all the inputs were correct and check previous calculation. - Shows results in any supported units. - You may easily toggle between metric and standard units. - You may round results to usable fractions from 1/2 to 1/128. - Four output formats, depending on if you need to show results as fractions or decimals. Intuitive interface for feet and inches calculation. - Displays both equations and results at the same time. - Two feet and inches representations - 2ft 3in or 2′3″. Q: Does the app also include yards and miles? A: Yes, it does support them as well as metric units (km, m, dm, cm, and mm) and nautical miles. Q: I need a conversion calculator that also converts within the metric system. Does Units Master convert from meters to centimeters and millimeters? 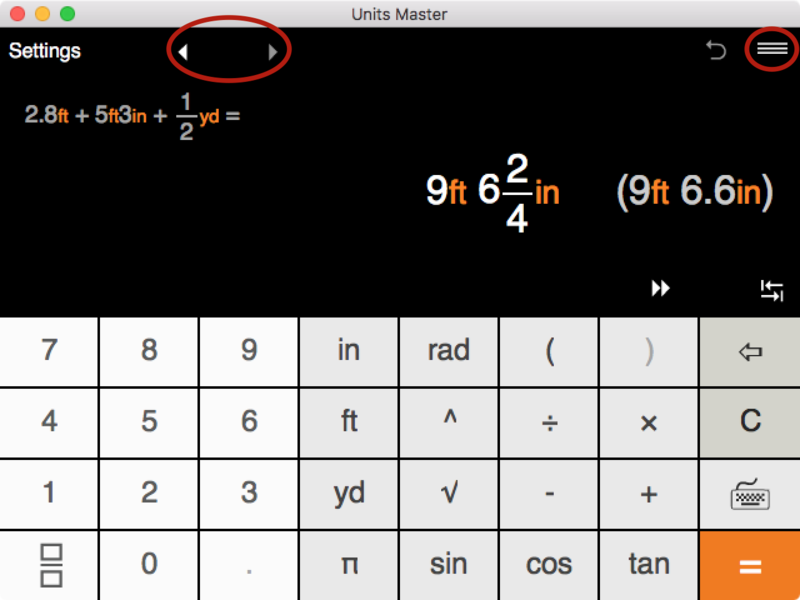 A: Yes, with Units Master you may convert between any supported metric units. For example, convert meters to millimeters, centimeters to decimeters, kilometers to meters, etc. 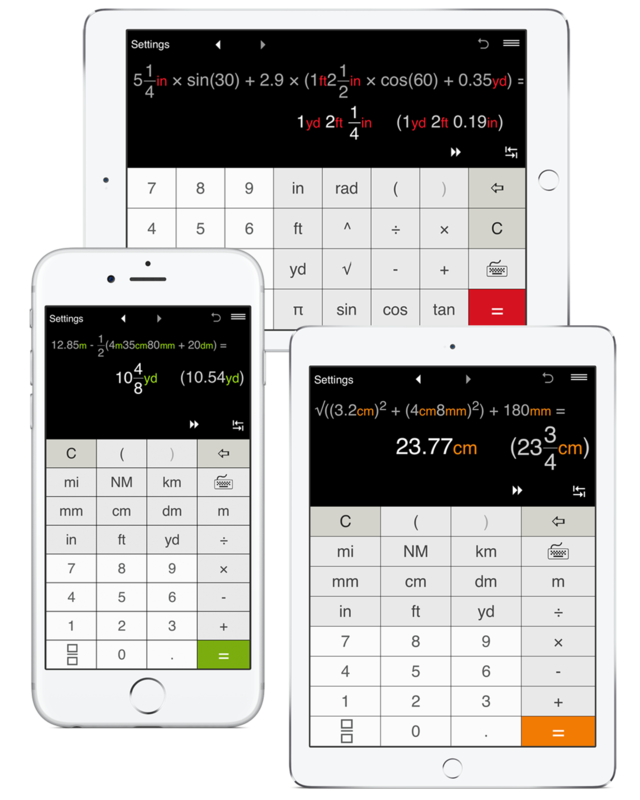 Q: Does the app work as a regular calculator or does it only convert units? A: Yes, it functions as a regular calculator as well. For more information see the Units Master features list. Q: How can I input fractional inches and feet? A: To enter fractions and mixed numbers, use the Fraction button. Fractions can be entered as proper fractions such as 1/2, 3/8, 5/32, improper fractions 3/2, 5/4 and mixed numbers. Q: I need to get results in usable fractions. Does Unit Master allow it? A: Yes, you may set the calculator’s fractional accuracy (1/2, 1/4, 1/8, 1/12, 1/16, 1/32, 1/64, 1/128, 1/256) in the Settings window. It is automatically set to 1/8. For more information please watch the video on how to get results in usable fractions. Q: Where can I find calculation history? A: Use the triple bar button ≡ to access the calculation history list, which keeps track of your past 25 entries. You can also use < and > to go forward or backward through your recent calculations. Q: Can I use Units Master to convert between decimal inches and fractional inches? A: Yes, with Units Master it is really easy. For both output formats, after you enter fractional or decimal inches and press =, the app automatically shows the result in metric units. To convert fractional inches to decimal or decimal inches to fractions, just press the 'in' button after you got the result. To convert fractional inches to decimal or decimal inches to fractions, just enter the value and press = .